Twenty six years has passed since Malaysia’s queen of jazz music, Dato’ Sheila Majid performed her first solo concert, “Konsert Lagenda” at Stadium Negara, and now she is set to perform at the venue for the second time for her first major solo concert in seven years. 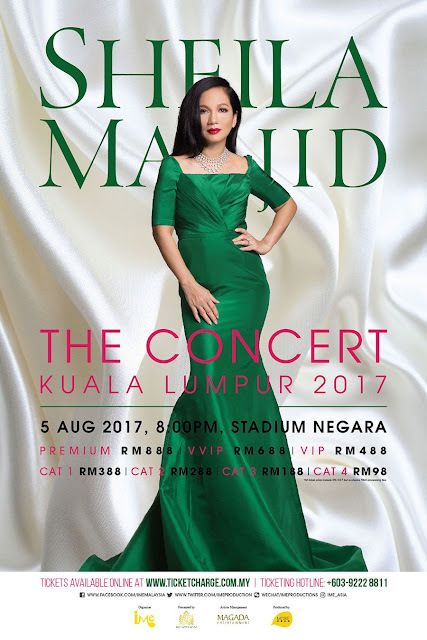 Dubbed as “Sheila Majid: The Concert Kuala Lumpur 2017”, will be held on 5 August 2017 and it is done to commemorate the singer’s latest 10-track album, “Boneka”, which is also the singer’s first full-length album in 13 years. “I named this album Boneka (puppet in English) because that’s what I turn myself into when I am performing on stage in front of the audience,” Sheila Majid told Star2. The 52-year-old songstress had her last major concert in Malaysia at the Dewan Philharmonic Orchestra KLCC in 2010, and since then, she has been busy with plenty of overseas shows in Indonesia, Singapore and Los Angeles too! Known for her iconic songs like “Sinaran”, “Warna” and “Lagenda” which broke racial and age barriers, fans can expect a stellar song list ranging from Dato’s Sheila Majid’s classics to her new album, coupled with her stunning stage prowess and impeccable singing skills – it will be another legendary concert you don’t want to miss!